Gen. Mark Milley Dunford has not publicly announced he is leaving his post. President Donald Trump has announced the nomination of Army Gen. Mark A. Milley to be the next Chairman of the Joint Chiefs of Staff. As the country's top-ranking military official, Milley would succeed current Chairman Gen. Joseph Dunford, who entered the role in October of 2015 under the Obama administration and is expected to serve until September. Dunford has not publicly announced he is leaving his post. The president announced the nomination on Twitter Saturday. "I am pleased to announce my nomination of four-star General Mark Milley, Chief of Staff of the United States Army – as the Chairman of the Joint Chiefs of Staff, replacing General Joe Dunford, who will be retiring," Trump wrote. "I am thankful to both of these incredible men for their service to our Country! Date of transition to be determined." On his way to the Army-Navy game, the president called Milley a "great gentleman" and a "great soldier." President Barack Obama, during his time in office, announced his nominations for chairman of the Joint Chiefs of Staff five months before they took the role. The predecessors never stepped down and were serving out their full terms. 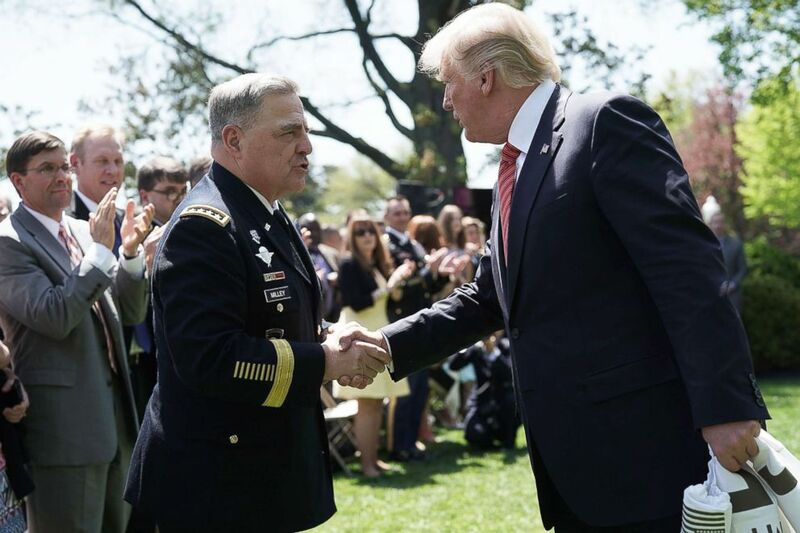 (Alex Wong/Getty Images) President Donald Trump shakes hands with U.S. Army Chief of Staff Mark Milley during a Rose Garden, May 1, 2018, at the White House in Washington. Departing the White House on Friday, Trump teased an announcement related to the Joint Chiefs that he said would be made at the annual Army-Navy football game in Philadelphia on Saturday. 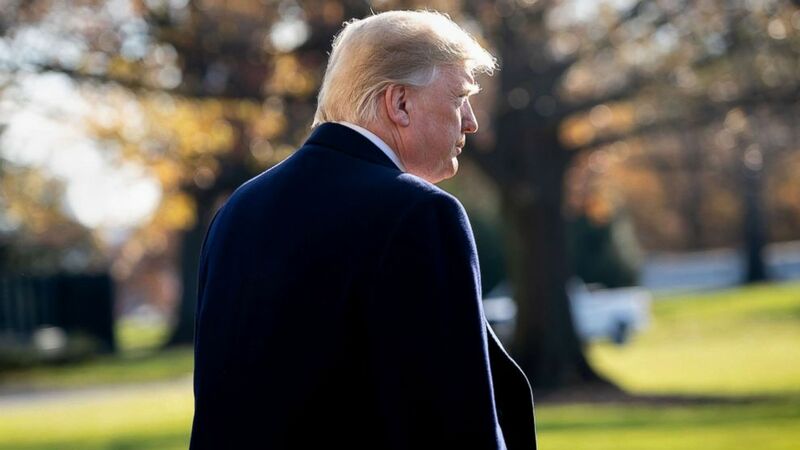 (Saul Loeb/AFP/Getty Images) President Donald Trump walks to Marine One prior to departing from the South Lawn of the White House for a trip to Kansas City, Mo., Dec. 7, 2018. "I have another one for tomorrow that I’m going to be announcing at the Army-Navy game," he told reporters. "I can give you a little hint: It will have to do with the Joint Chiefs of Staff and succession." The change comes as Trump is also likely to replace chief of staff, John Kelly, in the coming days, senior sources told ABC News. Milley is currently the 39th Chief of Staff of the Army, assuming duty in August 2015 after serving as the Commandant of U.S. Army Forces Command at Fort Bragg, North Carolina. Most recently, the general accompanied Trump to the Suresnes American Cemetery and Memorial in France this November to commemorate the 100th Anniversary of the end of World War I. 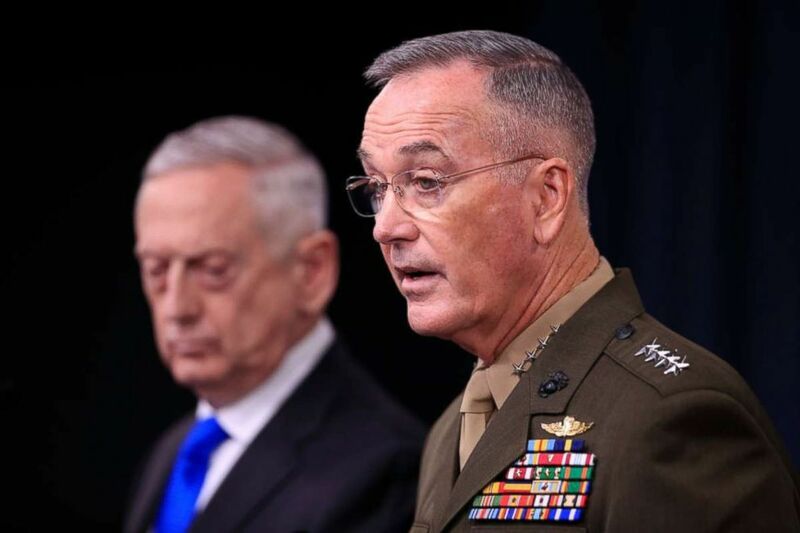 (Manuel Balce Ceneta/AP) Chairman of the Joint Chiefs of Staff, Marine Gen. Joseph Dunford, right, with Secretary of Defense Jim Mattis. speaks to reporters during a news conference at the Pentagon, Aug. 28, 2018 in Washington. The Winchester, Massachusetts native received his commission from Princeton University in 1980 and later received Master's Degrees from Columbia University and the U.S. Naval War College. His numerous overseas deployments include one tour in Iraq and three tours in Afghanistan – once as the Deputy Commanding General for U.S. Forces Afghanistan. He has also commanded the Army's 10th Mountain Division and served as a Military Assistant to former Defense Secretary Robert Gates. Milley stepped into the role as Army Chief of Staff at a time when the U.S. was ending over a decade of counter-insurgency operations in Afghanistan and re-aligning the military to focus more on near-peer competitors like China and Russia. As chief, he oversaw the creation of the Army's Security Force Assistance Brigades (SFABs) in Afghanistan, designed to reduce the strain on special forces. He also managed the establishment of Army Futures Command, which consolidated the Army's modernization process. Speaking to reporters at the Pentagon during a press conference about the new command, Milley said, "We're in the midst of a change in the very character of war."